My little boy Jacob is Thomas the tank engine crazy, he has Thomas bedding, toys, pyjamas and train sets. So when I heard that Stephenson railway museum in North Tyneside was holding a day out with Thomas event a few weeks ago I just knew that I had to take him. I bought a family ticket for two adults and two children for £35 and we kept the day out a surprise from Jacob. 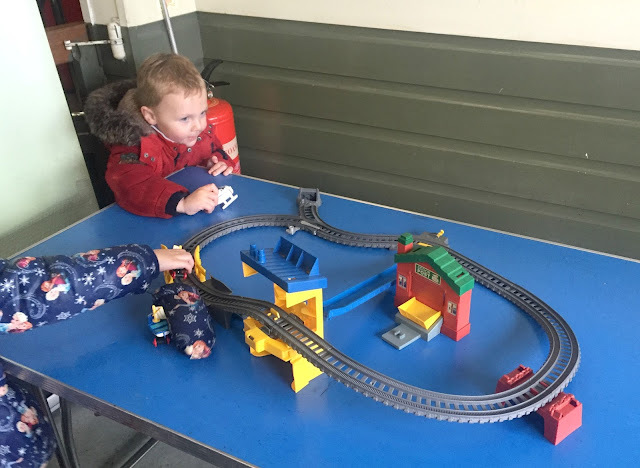 When we pulled up in the carpark the children had no idea where we were but as we made our way towards the entrance they seen the Thomas steam train and Jacobs little face lit up excitement. I have never actually been to Stephenson Railway Museum before, although I have passed many times in the car as it is close to the Silverlink retail park. On arrival, we were handed a goody bag containing activity books, certificates and stickers for the children. The day that we visited it was actually pouring with rain so I will state now that it probably ruined our experience. As it was raining we headed straight for the indoor area which as you can imagine on a Saturday, at a family event, in the rain it was extremely busy. There was little areas with a small soft play area, balloon modelling and face painting but it was a bit chaotic with people everywhere so we soon left after a quick play in the soft play area. When you book your tickets you are given a set time to ride on the steam train and we had around half an hour until it was our turn so we headed out to the marque which had a magic show on. Again as it was raining the marque was really busy, my children loved the show and were really eager to join in. However, we noticed that as it was a magic show they were understandably picking the older children but as Thomas is a pre-school character it would have been nice for the younger children to have a turn too. Another thing to mention is that while there is a Thomas steam engine there he did not really do anything when we were there. He was just parked up and you could go and have a quick look inside the cab and get a photo with him. I have seen some events where Thomas actually pulls the train but that didn't happen when we visited. It was soon time for us to ride on the steam train and the children loved this, we had brought Thomas flags from a little stand which were only £2 each and they were waving them in excitement. The steam train ride was lovely, it was an old-fashioned 1950's carriage that was actually really spacious and comfortable and so much nicer than train carriages these days. If you have visited the museum before you will know the train ride is only four miles so we were only on the train for about fifteen minutes and you can ride on it on Sunday's for around £15 a family - check the website for details. After the train ride, we headed back to get the children's certificates signed by the fat controller who we had seen before our train ride but he had vanished and was nowhere to be seen. Luckily the queue for the face painting was fairly short so they each got their face painted instead which was included in the price of our ticket. By this point we had seen everything and been on our train ride and the children were starting to get hungry so we headed to the very small onsite cafe. However, again as it was raining it was extremely busy with a huge line and no seats so we ended up leaving to go for food elsewhere, meaning we were only at the event for just over an hour. I was a bit disappointed with the event as I have read other reviews at other venues that had lots going on compared to the event we went to. I do think that the weather ruined things for us as we were cold and wet and everywhere was so busy, which I know can't be helped. I do think we would have had a much better day if it had not of been so wet and cold. The children seemed to enjoy the Day out with Thomas and that is the main thing and they still mention it now a few weeks later. Personally, I probably wouldn't go back to this event but I would definitely visit Stephenson Railway Museum again to go on the heritage train rides on a Sunday as this was the highlight of the day for us. I have also heard that the Santa train rides are good and I think we will try that this year as we did enjoy the train ride we just felt that the whole Thomas experience was, unfortunately, a bit of a letdown for us. 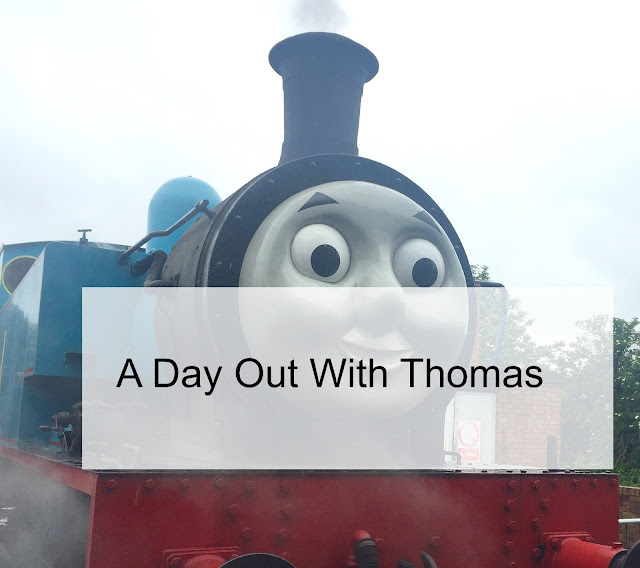 Have you been to A Day Out With Thomas before, is so what did you think? Oh no! I can't believe Thomas didn't pull the train!! What! I'd have been furious! This looks like so much fun for the children, though it is a shame that the Thomas event didn't live up to expectation. We're in Disney at the moment and I can totally appreciate having set times booked in for the the different events. Queuing with toddlers is no fun. At all! Such a shame it rained for you all and that Thomas wasn't active. As you said, the kids enjoyed it all the same, but you yourself know that it could have been so much better. My kids LOVE Thomas, my youngest especially, and yet I think he would be really disappointed that Thomas didn't even pull the train! It looks like you all had such a lovely day. We visited something like this in Suffolk and it was such a nice day, really well organised as well. 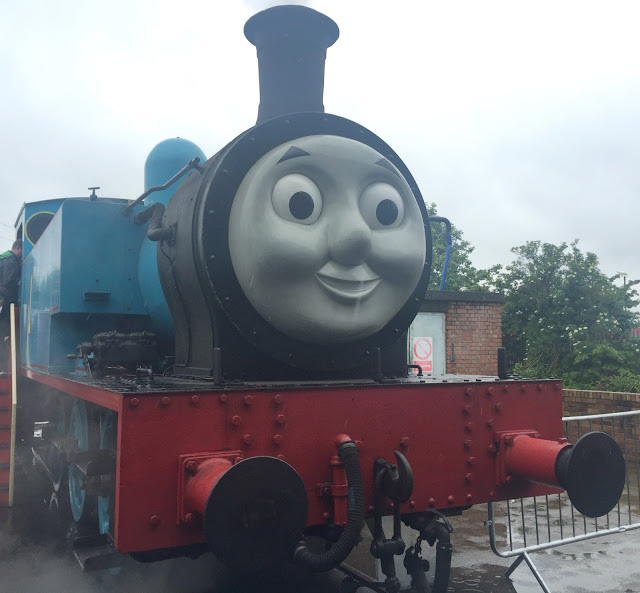 We took a trip to Thomas Land in Drayton Manor recently and would highly recommend taking any Thomas fans! Confession time: I've always found Thomas and his fiends a bit creepy - it's just those faces! Lol. We've done a Day Out with Thomas at the Forest of Dean Railway and loved it too. And we had rain too but it certainly didn't dampen our spirits. Such a great idea for Thomas fans! Thomas is such a great kids character, he always does make the kids happy and being able to have a go and ride too! Oh what a shame with the rain. I can imagine it being a fun place. 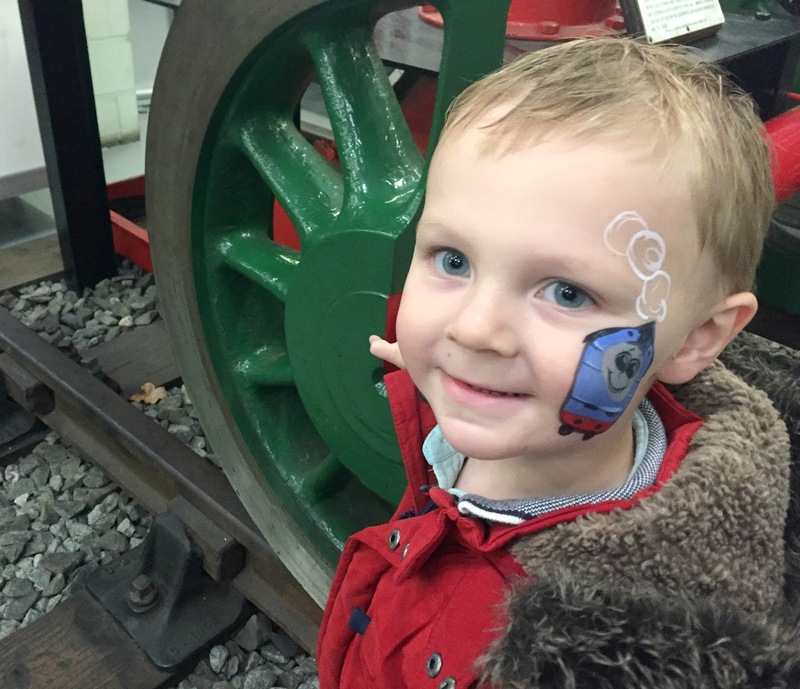 We went to a Day out with Thomas at Stephenson railway last year and it was excellent. It was a beautiful day, so there was lots outside, which probably wasn't possible if the weather was bad. It didn't really register with me that Thomas would pull the train, the fact he was there at all made my little boy's day, and he still kept saying 'We had a ride on Thomas'. We always take a packed lunch and we were able to eat on the grass outside. I can't imagine we'd have had nearly as much fun if it was raining. Poor you! My son would love this place. He's a Thomas the Train fan. Looks like a fun day, my little brother loved Thomas the Tank Engine! Yay for Thomas. My brother used to love him as he was a Thomas too. None of my three were really into trains but we have seen him a couple of times. I have never been on a train ride with Thomas but would very much love to of course. My nephew loves Thomas the tank engine. I guess this a brilliant place to take him and earn some favourite aunt brownie points. Thanks for blogging about our event. 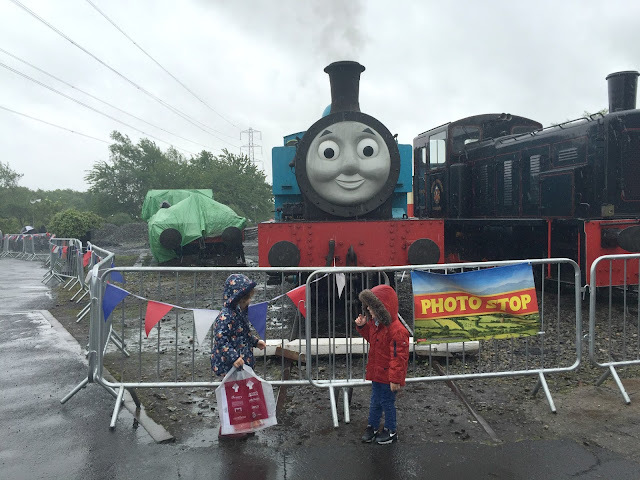 It’s a shame that it was raining on the day of your visit as the outdoor elements of the event involving Thomas are much better when it isn’t raining. We try to offer as many activities as we can indoors but obviously we’re restrained by the size of the venue. It’s good to hear that Jacob enjoyed most of his visit.